I am not to sure if I would plan a trip around the world to try all of the different types of food that are offered by McDonald’s but it is interesting to see how they adapt for each culture. Non of them shown here look as if they would be to different from what I eat normally , just formed a little differently. If you’re looking for some fine dining while traveling abroad, you might want to stop by a McDonald’s. The American fast food staple kicks things up a notch with some surprisingly creative dining options overseas. Take your taste buds on a tour of exotic burgers, breakfasts and desserts…#10 makes me want to buy a plane ticket right now. 1. 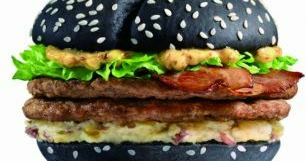 The Black and White burger in China, Hong Kong and Taiwan is a nod to the famous yin and yang symbols. 2. The Croque McDo is the chain’s take on the French classic croque monsieur ham and cheese sandwich. 3. Japanese McDonalds feature this prawn-patty sandwich. 4. Also in Japan, the Cheese Fondue Chicken Burger. 5. In Germany you can chow down on the Das Nürnburger featuring three bratwurst sausages and mustard. 6. India’s McCurry Pan comes with an edible bread bowl stuffed with savory chicken and veggies. 7. The France Burger fancies up the classic bun with baked ciabatta bread and tops the patty off with emmental cheese. 8. In the Philippines you can grab some McSphagetti, which comes with a side of McNuggets. 9. Italians finish off their fast food dining with a sweet kiwi dessert called Le Frescallegre. 10. Asian McDonalds feature this delicious combo of chocolate and orange in their fried pie selection. 11. Sticky rice fans can enjoy the McRice burger in the Philippines with either chicken or beef patties. 12. The Greek Mac flattens out the traditional BigMac with some pita bread in lieu of buns. 13. Turkey residents can find the McTurco, another pita bread sandwich. 14. The McCurrywurst in Germany includes sliced sausage coverd in tangy tomato sauce and curry powder. 15. Back in Japan again, the Carbonara Burger. 16. The McPumpkin Omlette Sandwich in Hungary will fill you up with egg, hashbrowns and veggies sandwiched between pumpkin seed buns. 17. Japan’s Cheese Katsu Burger is a pork patty stuffed with cheese. 18. Or you could go with the simple McPork while in Japan. 19. India’s McAloo Tikki is a vegetarian twist on the standard burger. 21. More Japan goodies: bacon potato pie. 22. Australians can start the day off with this deluxe breakfast roll featuring egg, hash brown, bacon and spicy tomato. 23. If the new Happy Meal mascot freaks your kid out, maybe move to Australia or New Zealand for a Happy Hippo Meal featuring Pasta Zoo. 24. Cheers! You can grab a beer with your burger in Europe. 25. In Poland, the Kanapka Drwala features pork rinds, a quarter-pounder patty, bacon, deep-fried cheese, sauce and lettuce. 26. North Americans can take a drive up to Canada for some McLobster Rolls. 27. McMolletes in Mexico are English muffins topped with refried beans, cheese and pico de gallo. 28. You can grab a cup of gazpacho in Spain. 29. Norwegian menus feature these salmon filet wraps. 30. In Malaysia you can pick up the Prosperity Burger with either chicken or beef patties. (via: DailyMail) Yep, I’m definitely ready for a trip around the world right about now. Share with your friends to see if they want to book a ticket to these tasty treats.